Coca-Cola is encouraging consumers to "slam dunk" their empty Coke bottles into recycling bins in an integrated campaign led by a 30-second TV ad. The campaign kicks off ahead of Recycle Week (24-30 September) and is fronted by the "Across the tracks" TV spot, created by McCann Europe, which will premiere on Saturday (15 September) on ITV, Channel 4, Channel 5 and Sky TV. The campaign centrepiece is part of a broader push aimed at rewarding consumers who recycle their bottles, and will include a competition and social media activation using the hashtag #CokeDunks. Consumers are encouraged to film themselves "slam dunking" Coke bottles into recycling bins, sharing their performances on Facebook, Twitter and Instagram throughout September for the chance to win prizes. In the 30-second ad, a woman misses her train. She is distracted from her frustration by watching a young man on the opposite platform drinking a Coke from a vending machine. Their eyes meet across the tracks. He quickly buys another Coke and alights a train that has just come into the station. Meanwhile the woman has boarded a train on her platform. The man fights through the crowded carriage to pass her the drink through the window, with his social media handle written on it. He smiles at her, she smiles back, and hands him the now empty bottle. She texts him: "Thanks for recycling that Coke", which he looks pleased about before slamming the bottle into a bin. Meanwhile, the #CokeDunks aspect of the campaign will feature brand ambassadors including Olympic gymnast Nile Wilson and freestyle basketball player Tom Connors, both of whom will apply their sporting prowess to performing "epic dunks". Coke is also launching a Snapchat Lens that challenges people to virtually dunk as many digitally-rendered bottles as they can. The campaign will climax in Recycle Week, when Coca-Cola is taking over London's Piccadilly Lights. 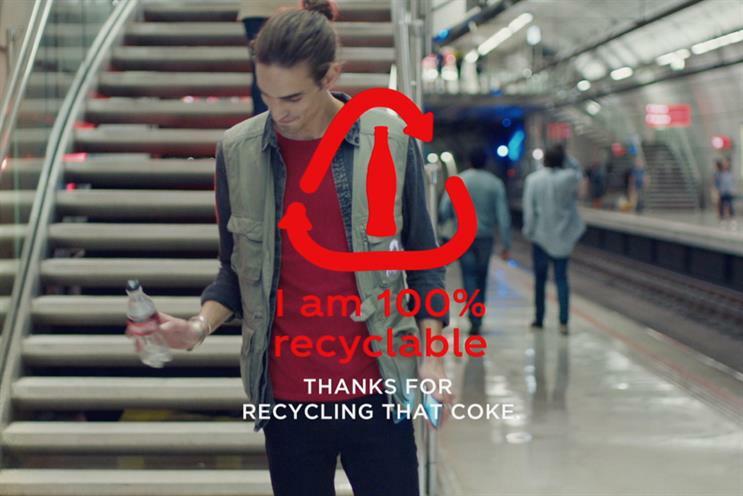 This campaign marks Coke's latest attempt to promote sustainability. It recently partnered with Merlin Entertainments to offer people 50% off entry to attractions in exchange for recycling their plastic drinks bottles. Coca-Cola's packaging is 100% recyclable and contains 25% recycled plastic. Coke is committed to upping the latter figure to 50% by 2020.